Chris loves rice dishes, so fried rice was almost guaranteed to go over well (it did thankfully). This is a pretty simple take on the dish, a staple of Chinese restaurants. You can use white or brown rice or a combination, as I did here. To make this a quick week-night dish, cook the rice ahead of time (I did it the day before). 1. Whisk together soy sauce, sherry and cornstarch. 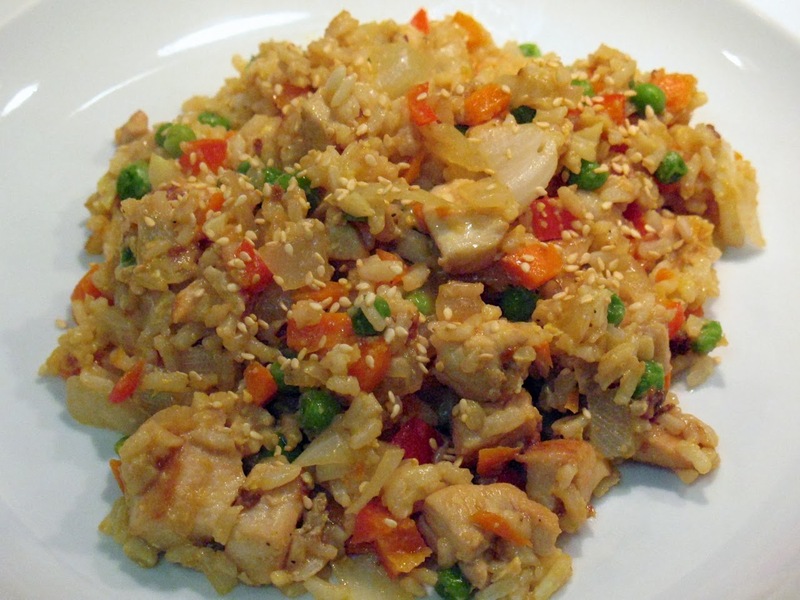 Combine chicken and soy sauce mixture in a medium-size bowl, stirring to coat chicken. Set aside to marinate a few minutes. 2. Heat 1 tbsp. oil over medium-high heat in a large sauté pan. Add onion, bell pepper and carrot and sauté until softened, about 5 minutes. Add peas and cook another 2 minutes. Remove cooked vegetables from pan. 3. Add 1 tbsp. oil to pan. Add chicken with marindate and sauté until lightly browned and cooked through, about 5-7 minutes. Remove chicken from pan. 4. Add remaining 1 tbsp. oil to pan. Add garlic and ginger and sauté about 1 minute. Add cooked rice and stir to break up and mix with the oil. Make a well in the middle of the pan. Add the egg and stir to scramble. Once it solidifies, mix together with the rice. Add cooked chicken and vegetables. Add 2 tbsp. soy sauce, 2 tbsp. sherry and 1 tsp. sesame oil. Stir to combine all ingredients and cook about 2 minutes to warm through. Season with freshly ground black pepper and serve topped with sesame seeds. You are correct: I LOVE RICE! This was a great dish and I recommend it to all your readers. Thanks for making it!